The Martin J. Whitman School of Management and 2U Inc. announced Tuesday the start of the inaugural class of students in MBA@Syracuse, the school’s newly enhanced online M.B.A. degree program powered by 2U. The first MBA@Syracuse students, a group of more than 100 participants hailing from around the U.S. and five different countries, began their studies on Jan. 9. The program is delivered in partnership with 2U Inc., which partners with leading colleges and universities to deliver the world’s best online degree programs. MBA@Syracuse has more than 100 participants from around the U.S. and five countries. MBA@Syracuse allows students from anywhere in the world to take part in the highly regarded Whitman M.B.A. program—without having to relocate or put their careers on hold. 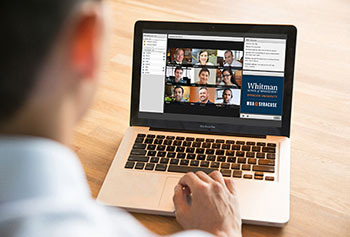 Classes take place on a live, online platform taught by Whitman’s award-winning faculty, connecting students with the comprehensive education and experience they need to succeed in today’s competitive business environment. MBA@Syracuse graduates receive the same Whitman degree as on-campus students, completing a 54-credit-hour program with 36 core course credits and 18 elective credits. Upon completion, the first graduates are expected to apply their education to a wide variety of industries, ranging from financial services and consulting to pharmaceuticals and healthcare, media and entertainment, government and nonprofit, and more. Students also will participate in multi-day domestic and international residencies throughout their program, which offer students the chance to meet classmates and professors face-to-face for workshops and networking experiences. For more information on MBA@Syracuse, visit http://onlinebusiness.syr.edu/mba or follow the program on Twitter at @BusinessatSU. Those interested in learning more about admissions requirements and about the program can contact an admissions counselor at 844-797-4622 or admissions@onlinebusiness.syr.edu.